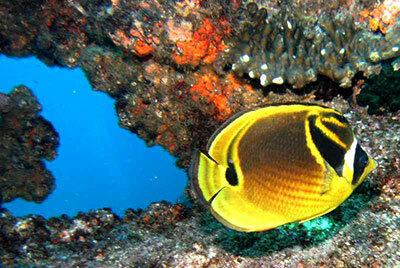 In addition to the reef itself, there are also two good wrecks on which to dive. 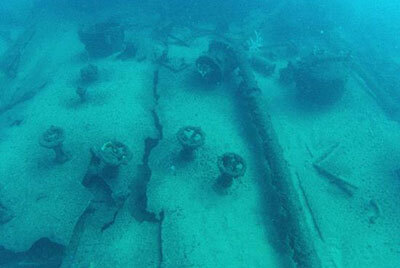 The Produce, an 18 000 ton Norwegian tanker that hit the Shoal and sank in 1974 and the second wreck is the Nebo, which struck the shoal in May 1884 and sunk almost immediately with its cargo of railway material. 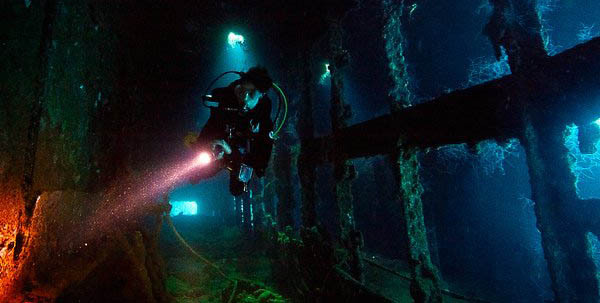 Both wrecks lie at approximately 30 meters and are fairly intact, which makes for great wreck diving. On Aliwal there are two methods used to dive with Sharks. A “baited shark dive” with the target species being Sand Tiger Sharks (Raggies), Zambezi (Bull) Sharks and / or Tiger Sharks. Diving with these three species of Shark is seasonal. Please refer to our Website link https://www.divethebig5.co.za/shark-timetable.html to see what sharks you can expect to encounter, and when. Please remember, the Sharks have not seen this link, so they don’t know where they are supposed to be, and when! Ii addition to “the target species” you can also expect to encounter Dusky Sharks and Black Tip Reef Sharks, as these two species are present on Aliwal all year round. “Free diving” no bait is needed, with the Sand Tiger Sharks “Raggies” or Grey Nurse Sharks. Raggies are found on the Shoal from July through October. All “Raggie” diving is done on scuba and we usually do the first dive as early in the morning as possible, at first light, so as the be the first group of divers on the reef, as this is when we "catch" the Raggies resting. As more and more divers descend on the reef this tends to drive the Raggie off. After the first dive we return to the Lodge for surface interval time and breakfast before going out for the second “Raggie” dive. Sometimes we may do a 2 tank dive without coming back for breakfast. SIT is done on the boat. Aliwal Shoal is situated 5kms (3 miles) off the village of Umkomaas, which is about a 45 minute drive from central Durban. Some divers who regularly dive Aliwal say the dive is second only to the boat ride through the breaking surf to get to the shoal, some divers use up all their air on the ride out - before they even enter the water! 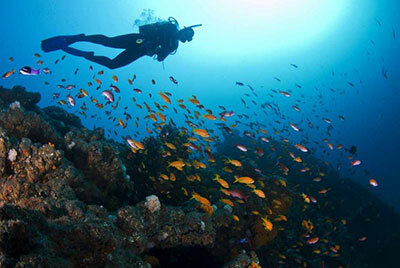 Depths vary from 6 to 27 meters (19 to 88 ft.) and offer a tapestry of diversity. The Cathedral area of the reef is one of the more spectacular dives. 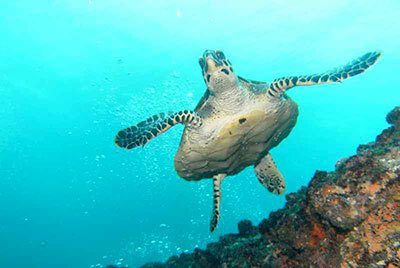 Its inhabitants include the Ragged Tooth Shark, Loggerhead Turtle and Ribbon Tailed Rays. For the more daring diver the reef sports a landmark of international importance - Raggie Cave - one of three locations on the reef famed for its shark diving; the other two being Cathedral and Shark Gully. From July to December the Shoal is the congregation point for Ragged Tooth Sharks, where up to 60 sharks have been encountered at any one time. In the history of diving the Shoal there has been no recorded incidence of aggression or attack between the thousands of sharks and the hundreds of divers frequenting the reef. The Aliwal Shoal is not just a vivid pageant of marine life but it is also the final resting-place of two unfortunate ships, which were once ripped asunder by the upper reaches of the reef. 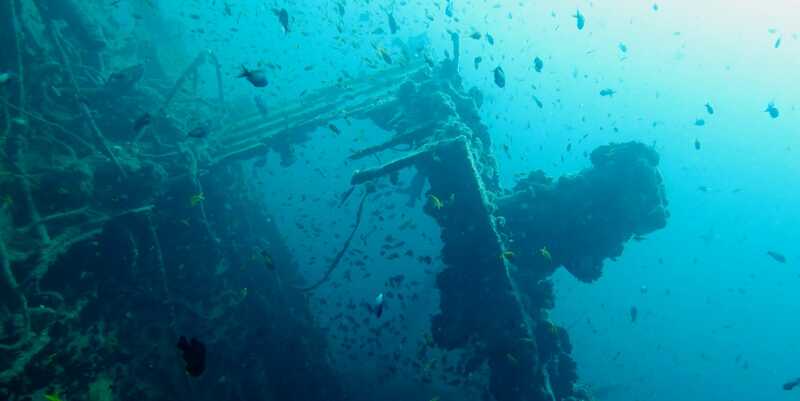 The Produce (1974), once a 2000 ton bulk carrier, lies on the sandy bottom at 30 meters (100 ft.) and its rusted framework has formed an established reef, home to many species of fish, including 20 tame Brindle Bass. The Nebo which sank on its maiden voyage in 1884 lies at 25 meters (82 ft.). The Aliwal Shoal is like a magnet, inextricably drawing countless ocean species into its realm - now it extends the same invitation to you. Water temperatures vary from between 19º C to 25º C (66º F to 77º F). Location: 30º15,20’S, 30º49,00’E north and shoreward of Aliwal Shoal – boat entry. The Nebo struck Aliwal Shoal on May 20, 1884 in fair weather and went down immediately with its cargo of railway material. Fortunately no lives were lost. She lies bottom-up, a rather surreal sight and is still fairly intact. Location: 30º 5,00’S, 30º49,30’E north and shoreward of Aliwal Shoal, a little further south and east on the Nebo – boat entry. The Produce was a Norwegian bulk molasses tanker that struck the north-east pinnacle of the shoal on August 11, 1974 and then drifted off to its present resting place where it lies on its side. No lives were lost. Big game fish, such as daga salmon and kingfish are present as are most of the usual small tropical fish and many resident brindle bass.